Rockstar Energy Husqvarna rider Pela Renet of France will tomorrow complete the final stage of the 9,000 km Dakar Rally and now has his goal of a top 10 finish firmly in his sights. Renet, who came from enduro racing and rode in his first edition last year was sixth in Friday’s penultimate stage from San Juan to Rio Cuarto, a distance of 754 km with a two-part timed special of 288 km. The ride to the finish in Buenos Aires on Saturday is another 786 km, but includes a short, 64 km final timed special. 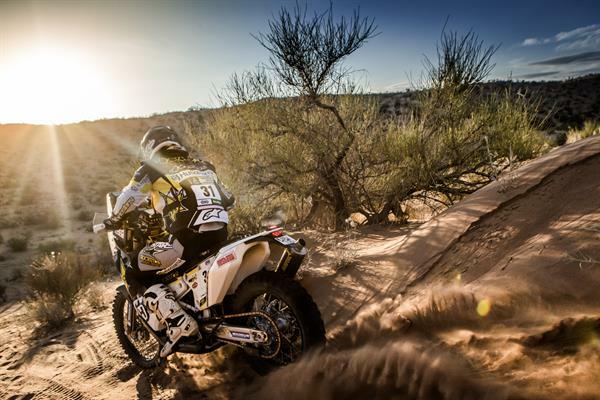 The French rider, who was injured in the 2016 edition, has delivered a very strong second week and has elevated himself into the spotlight of a rider to watch in future Dakar Rallies. He has been consistent and has been gaining in confidence, and Friday was no exception. He finished the stage in sixth place and is now seventh in the overall standings. The factory team was struck a heavy blow on Thursday when Paolo Quintanilla has to retire after fighting his way into overall second. Up to that point he had been riding particularly strongly in the second week and was on track to improve on his podium third in the 2016 edition of the rally. The Chilean had a hard fall in the timed special of stage ten and briefly lost consciousness. Although he tried to continue he eventually had to abandon because of feeling dizzy and disoriented. Quintanilla: "It was a black day for me, one that anyone involved in the sport does not want to have. But it’s part of what we do and I’m happy that I wasn’t injured in what was a heavy fall. Now I will return to Chile. I will rest a couple of weeks and I will train harder than before, because fighting for this race remains my big goal." Riders will contest the final stage in reverse order to conclude two weeks of brutal competition through Paraguay, Bolivia and Argentina, with extremes of temperatures from 40 degrees Celsius to close to freezing in the high altitudes of Bolivia. They have encountered deserts and mountains, floods and landslides, many of which added even more difficulties to what is the world’s most challenging offroad contest.